Initialization: This step is executed first and it is executed only once when we are entering the loop for the first time. This step allows you to declare and initialize loop control variables. Condition: Next step after initialization is to check the condition if the condition is true, it must return a boolean value. It is an entry controlled loop so the condition will check before entering into the block of code. Update statement: After execution of the loop body, increment or decrement step is executed. This statement updates any loop variable. First, initialize the variable 'i=1', It executes only once when we are entering into the loop. In the second step check condition i.e. 'i<=5'. In the third step, control goes inside the loop body and execute (print Hello five times). Next step is to increase the value of the variable i.e. (i=i+1 i.e i=2). Repeat above four steps until the condition becomes false. 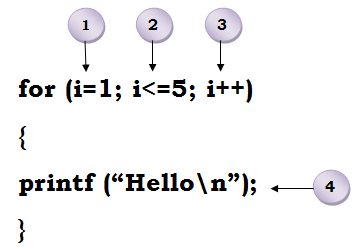 Output: This code prints the statement "Hello" repeatedly (infinite times). Many variables can be initialized in the initialization block of for loop, whether you use it in the loop or not. //Program to illustrate initializing many variables in the initialization block. 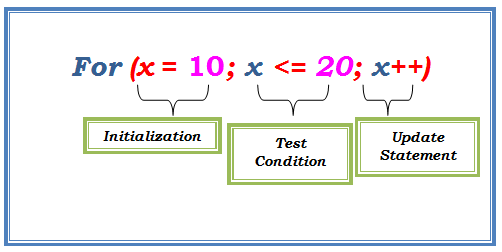 Two variables are initialized and declared in initialization block, in which one variable i.e. 'z' is not used. 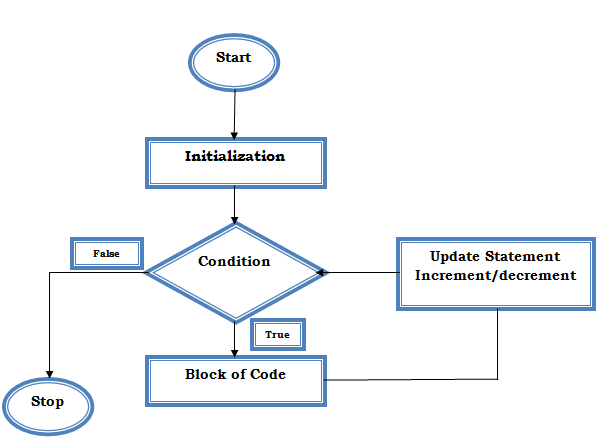 The variables that are declared in the initialization block can be accessed only within the loop. In the above example, variable x is not accessible outside the loop. The statement which is commented gives a compile error.